Thank you for your commentary Jake. I find your expertise in seasonal trades to be of great value in conjunction with technical and fundamental analysis. Please don't ever stop. 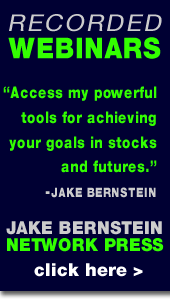 Mr. Bernstein's seasonal research has always been an integral part of my trading system(s). The fact that he publishes (some) of this research for free on his WWW site is unbelievable! Thanks Jake. I'm renewing my subscription. I'd like to thank you in writing for your course... it is excellent and has worked well for me! Thanks again for a fabulous body of work. Your work in futures has made the education field USEFUL!!! - J.J. I have been following your Monday Futures Commentary for several months now. 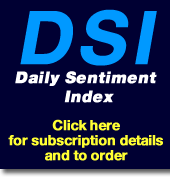 I really enjoy them and find them very helpful and informative; In fact, I am going to subscribe to your trial offer of your Commodity Trading Letter and Daily Hotline Update... I think you for your hard work and endeavors ... Keep up the excellent work. I saw you on television in St. Louis and what you said made too much sense to ignore ... Thank you for motivating me to take some sort of action. - J.&M.T. You're appreciated and that its just a sad fact that people when satisfied remain silent and only rouse themselves to complain. - R.V.S. I have yet to subscribe, but I have been following your work. Your candor is refreshing. - B.E. Well I am still using your 10/8 moving average channel and it is still working. You should be invited to appear on CNBC like Cramer and give your views. Better yet, you should have your own TV show! Then after, your own TV channel 24 hours a day! Keep up the good work! I would like to thank you in writing for your course...it is excellent and has worked well for me! Thanks again for a fabulous body of work. - J.J. Your books have been helpful as has the Weekly Market Commentary. Thanks for the encouragement, information and realistic approach to the futures business. - J.E. Recently I purchased The Compleat Day Trader -- what a wonderful book!! Again thank you for your insights and for providing the internet site. - G.S. I have been following your work. Your candor is refreshing. - B.E. Investors Quotient was probably one of the Top 10 best books ever written..it helped (present tense too) me enormously.. - S.W.B. I have bought your seasonal trades program and books and really enjoy them too. Keep up the good work!! - C. B.
I bought your 4 video tapes and found them to be full of good information. - B.S. I love your site, your commentary and opinions. - C.L. I want to thank you for your time and effort to provide the world with this information. You certainly will help with my success! - C.S. I really like your work and appreciate what you do. Thank you very much. - J.R. I have bought the seasonal CD at the London seminar. I am really astounded at the tendencies these commodities already researched have shown. - I.F. I have purchased and read your book How the Futures Markets Work. Very, very good. I have also found your advice on your web pages to be excellent. Thank you for your work in educating us! - R.B. Your group really works in the best interest of their clients it's a very refreshing experience for me. - L.H. Just want you to know that I have enjoyed your letter both for recommendations and education comments. Hope you can contribute to educate those of us who are just learning. - B.J. (your) effort was greatly appreciated and I found these insights very helpful in my early and continuing education. I only wish I had found them sooner! - L.W. Thanks for your help. Without you I would not be trading today and definitely would not be as good or as confident as I am today, I quit my Day Job 2 months ago and now I trade full time. - B.C. This summer I attended your seminar in Tampa. You were kind enough to speak with me personally. Since then I started trading at the end of August. I use your materials to look for potential trades and have done very well. - M.O. Last November a friend and I attended the FSI seminar in Las Vegas. We selected you out of all the varied speakers to study. Then in December we attended your 3-day personal seminar in Ft. Lauderdale. Without a doubt, this was the greatest thing we have ever done to change our lives in the business world. 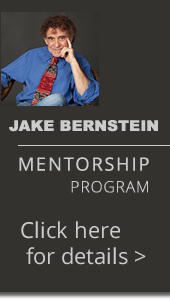 So I will ever be grateful to Jake Bernstein for changing my life. - C.H. I should have expressed my appreciation a long time ago. I have been reading your Monday internet letter for quite some time. I do appreciate your efforts and when I can, I'll reciprocate. - Z.G. What an enjoyable read every week!! I am new to the markets and I'm glad I found you on the net. You make a lot of sense out of an otherwise confusing subject, especially for a newcomer. Just wanted you to know that there are people who enjoy your written word every week!! Thanks for the information. - T.W. For the first time in 10 years, after trying everything possible, you have given me the tools that I needed to make money and to be successful. You have changed my life for the better. - J.M. I want to thank you for your help and look forward to using your trading information. I am very impressed with the response from you. - D.D. I came close to violating every rule and making every mistake in the book which is reflected in my fund(s) hitting a current low of $1200.00. I am positive that had I found you earlier, my story would be vastly different. If only there was a way to get your message to the newbie's out there before they self-destruct. I know it would have save ME a lot of grief. - L.C. You provide a wealth of information at no charge, and I look forward to soon taking advantage of some of the reports, books and other information you distribute. Thanks for such a great web page. One of the best I've seen! - L.S. I appreciate your comments on the internet. Periodic visits to your web site seem to bring me back to center and with better focus on successful futures trading essentials. Thanks! - J.B. Your comments about our cultural teachings fits those of us whose parents endured the depression. we think we don't deserve it unless it's hard-earned. Just your phrase go with the flow of life has me relaxed. I'm gonna (sic) get off my own back and take a new approach. - S.T. Great weekly letter on your web page. Love your lesson on trading every week! Also agree with your direction on stocks, bonds and gold. Only trade gold funds, no futures. However, keep up the great work. I read part one of your article tonight: The Value of Using Support and Resistance. It is the best piece on futures trading that I have read. I concur completely. - J.M.